What kinds of tattoos and pigmented lesions can be treated? A tattoo’s color, depth, and the chemical composition of the ink all affect how if responds to laser light. Black, red, dark orange, and dark blue tattoos will usually respond relatively quickly to treatments with the Q-Yag System. However, green, purple, brown, light orange, and light blue colors may respond more slowly. 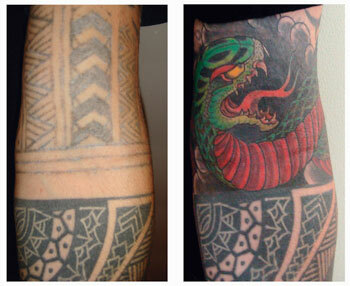 In general, most tattoos can be successfully treated, given a sufficient number of treatments. The Q-Yag 5emits a highly focused beam of intense laser light. This light passes harmlessly through the outer layer of the skin and is absorbed primarily by the tattoo ink or the excess pigment within the lesion. As the light is absorbed, it is converted to heat. This all happens within a tiny fraction of a second, and the sudden rise in temperature within the treatment target fractures the ink or pigment into tiny particles. White blood cells then carry away these particles to be naturally eliminated by the body. Immediately after laser exposure, the treated areas may become whitish-colored and swell slightly. This whiteness and swelling tend to go away in about 30 minutes. Over the next several days, some mild crusting and small blisters may appear over the treated area . As this crusting resolves, the tattoo or pigmented lesion will fade. The tattoo or lesion will typically continue to fade for many weeks thereafter. Depending on the size and location of the tattoo or lesion, each treatment usually takes about 10 to 30 minutes. Some faint tattoos and pigmented lesions will fade completely after only one treatment, though most require at least five or more treatments. Treatments should be spaced six to eight weeks apart give your body sufficient time to fully eliminate loosened particles of ink or pigment. Are they any side effects? Because the laser beam does not penetrate beyond the skin, side effects are rare. When side effects do occur, they are usually mild and confined to the treatment target. A list of common side effects is found on your consent form. Your technician can provide you with a copy, upon request, and will happily discuss them is further detail. The alternatives for pigmented lesion removal vary, depending on the nature of the lesion. In the case of tattoo removal, however, laser treatment is the only effective method that is unlikely to cause any scarring. The alternatives to laser tattoo removal include surgical excision, salabrasion (using salt to burn away layers of skin). These methods not only cause scars but can also be painful. Laser treatment with the Q-Yag is a state-of-the-art treatment that yields excellent results without the perils and disadvantages of other procedures.